Software documentation is becoming increasingly important—not only in the software industry but also with many other products. Today, hardly any machine or other technical device can be controlled without software. However, in many ways, software documentation is different from classical technical documentation. Are you or your staff challenged with having to write some software documentation, but you don’t have much experience in this field? Or do you already have some experience in writing software user assistance and want to augment your knowledge? 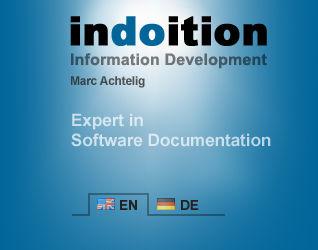 Adapted to your individual projects and prior experience, my in-house training on software documentation / on-site training on software documentation teaches you proven methods of how to create high-quality software documentation. ▪What are the best formats for my software documentation? Online help (online documentation)? Classical user manual? Screencast? Embedded help? Should it be context sensitive or context free? ▪What content should go into my documents? What can I drop? ▪How should my software documentation be structured—both on top level and in detail? ▪How can I quickly guide the readers to the information they need in a specific situation? ▪What do I need to pay attention to when adding screen captures? ▪How can I create both online help and printed documentation (PDF manual) from the same source? ▪Which tools can make creating software documentation easier and more productive?